I was surprised to find raw fish outside of japanese cuisine and on local tapas menus. 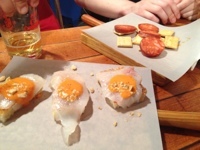 The raw cod with salmorejo was tender and fresh. Salmorejo is andalucian gazpacho and it adds bread to the normal ingredients; pepper, tomato, garlic, cucumber, olive oil and lemon juice. 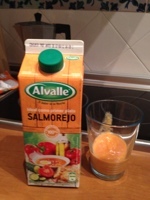 I prefer gazpacho because it is less rich, and more refreshing than salmorejo. A trick with garlic, remove the heart of the clove to take away the punch of garlic. Also, spanish has a term of no repeating flavors that is the mantra of a balanced meal.